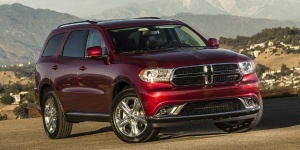 For 2015, the Dodge Durango R/T comes standard with a new Beats audio system, which is optional on Limited and Citadel models. A Blacktop Package featuring unique gloss black exterior applications and 20-inch aluminum wheels is optional on all but Citadel models, while the Rallye Appearance Package is now also available on Limited models. Red Nappa leather seating is an option on R/T models. Find the used Dodge Durango of your choice from a dealer in your area. Search our used car listings now.